Cole Blake, son of Landon and Ashley Baxter Blake, is months away from going to college. As he starts his final semester of high school he meets Elise, a mysterious new girl who captures his heart. Elise is set on mending her wild ways but soon discovers that she’s pregnant. Cole is determined to support Elise—even if it means skipping college, marrying her, and raising another man’s baby. When Elise decides to place her baby up for adoption, she is matched with Aaron and Lucy Williams. But as Elise’s due date draws near, she’s having second thoughts about the adoption. With Cole keeping vigil and Lucy and Aaron waiting to welcome their new baby, Elise makes an unexpected decision—one that changes everyone’s plans. 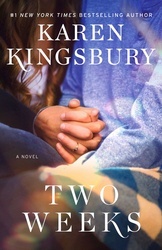 Karen Kingsbury is America’s favorite inspirational storyteller, with more than twenty-five million copies of her award-winning books in print. Her Baxter Family books are being developed into a TV series slated to debut fall 2019.